There are different forms of ‘fear of man.’ One is when our thinking and behavior is dominated with a person may think or do. Often fear of man involves people pleasing. We think that if we appease that person we are safe from rejection. Help us to not get trapped in seeking approval from others. That seeking of approval or appeasement sets us up to be vulnerable to pressure from peers and people, a trap of the adversary. It sets us up to chart our course and make our choices on the basis of what people may say or do. It creates an illusion of safety. 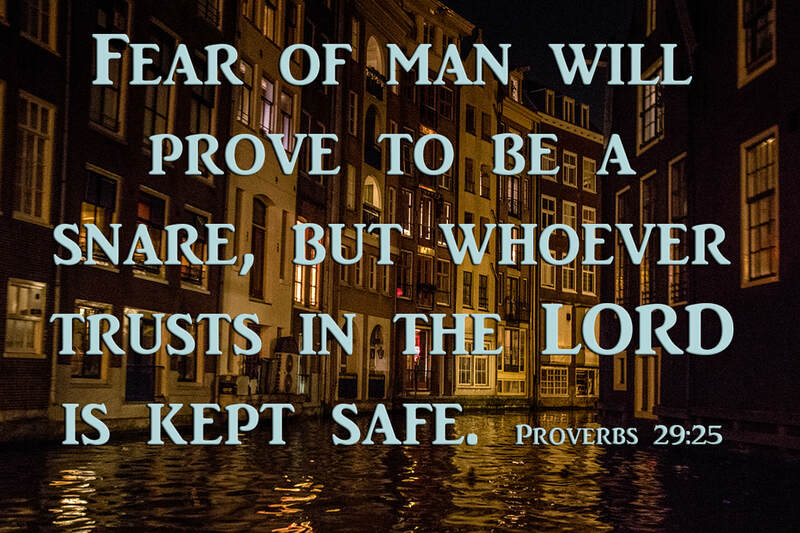 Proverbs 29:25 shows us that when we see the God who keeps His promises as our refuge and when we run to Him, we are on the higher ground of perspective, strong and beyond the reach of this trap. We focus on HIM (not on what we fear) and His ability to lead us and protect us in the midst of what we fear. True strength and safety are found in trusting HIM. "We should enter and dwell in 'the secret place of the Most High,' separating ourselves from and rising above the turmoil that is on every side.--this place is very real, literal, and a substantial condition: a condition in which the almighty power of God overshadows you--like a strong fortress around you--because He is our refuge and fortress we shall triumph over every device of Satan, whether it be an attempt to overpower us, or beguile us, whether he goes about as a roaring lion, or whether, snake-like, he stealthily lurks about, to inject his venomous poison.--The heavenly Father carefully notes the love you have for Him--Your love for Him is like a continuous prayer."